Living a dream — the classic example of Forex success from the ads described above. Not much more to say here — you just get so good at trading that you trade with extremely high accuracy and can afford to risk huge amounts of money per trade for tremendous gains, which results in a lifestyle of an opulent aristocrat. Trading actively like a full-time job — your classic 9-to-5 but with Forex trading as the only activity and your own choice of actual hours (OK, probably not your own but those representing the best strategy + market hours combination). You approach it like a job, get your regular withdrawals out similarly to a salary, and lead a life that depends on your skill level. Trading Forex full-time has its cons and pros. Following profitable signals — you just find a successful signal provider and follow them until they stop being profitable or disappear, and then you find the new ones, and so on. To me, it looks like a strange idea of a success, but it seems to be popular among Forex novices. Of course, it requires the ability to find good signals constantly, which is quite tricky in and of itself. Investing in a personal trader — some people do not like the idea of trading themselves, they prefer investing. Finding a successful trader who accepts capital under management and investing with him or her can be attained in a number of ways. Nowadays, PAMM accounts are all the rage. However, if the sum of money is large enough, it is probably worth finding a great trader personally and signing an individual contract with them. Similarly to relying on signals, this sort of success is prone to external shocks (trader or signals service retirement). Investing in a fund — finding a reputable FX trading fund is not that hard, but living off its profits would require significant size of investment. Also, akin to the previous two success models, this one can also suffer from second-party‘s lack of consistency — be it long periods of losses or bankruptcy/disappearance. Working for a prop trading shop — proprietary trading is a dream of many traders who believe that they have enough skills but lack enough capital to work with. 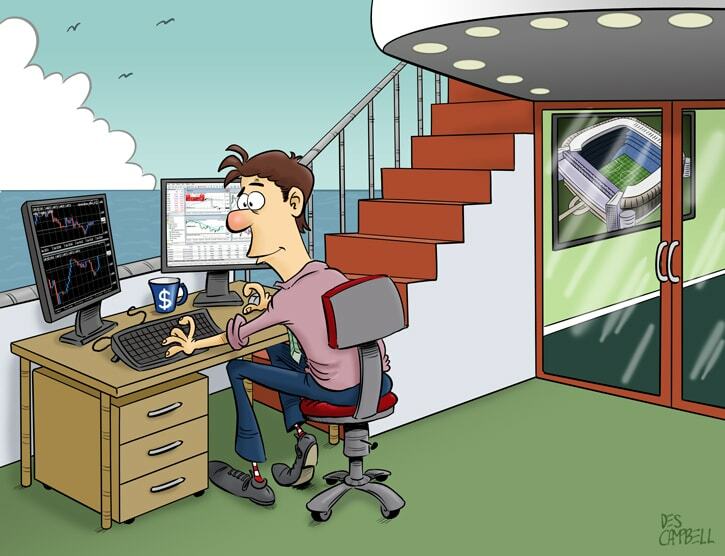 Getting a desk at a Forex prop shop can provide a talented trader with enough money, necessary risk restraints, and perhaps even some worthwhile tools and analytical information. It can be considered a full-time job with reward you get depending on your ability to trade profitably. Just a small part-time side income — trading Forex part-time is the reality of many successful traders. After all, trading is a game of probabilities, and there is always a risk of loss. Having some backup income in addition to the speculative earnings relieves from destructive pressure to over-trade and over-risk. Yes, a lavish lifestyle seen in ads is probably less attainable this way, but this approach is definitely less dangerous to your solvency. Taking a few trades a year to earn some additional income — being knowledgeable in some exotic pairs or being able to predict important macroeconomic indicators for the majors can lead to quality long-term trading opportunities. It would be nearly impossible to generate a significant share of income this way, but nonetheless, such infrequent trading may form an important part of personal success. Managing fully automatic expert advisors (robots) — although it may look like an activity similar to following Forex signals, in reality it is a complex task. Traders can learn to code and create successful expert advisors. Operating such an EA may involve frequent backtesting and adjustments to keep up-to-date with the changing markets. Even though there is no manual trading on the part of a “trader,” a sustainably profitable automated setup can be a worthy goal. How do you see your optimal long-term Forex success? If you want to share some specific details of how you envision your own success in currency trading, you can do so using the commentary form below.